I found this Praying Mantis on our garbage and thought it was dead. It was moving really slowly and couldn’t keep its balance. I think it was because it was 38°F outside. I took it in to take a few photos and it started being more active. I was going to put it back outside after taking its photo, but I wasn’t sure if the cold weather would kill it. So I’m keeping it indoors for now, until I can figure out what’s best to this little fellow. 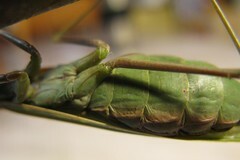 I gave it some water by putting the Mantis on a moist paper towel and it immediately started licking it. 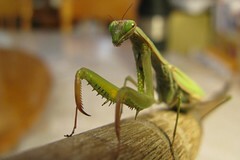 This entry was posted in Uncategorized and tagged garden, praying mantis. Bookmark the permalink.